Eden Hotel is great value if you don’t mind being one kilometre from the centre. Ad Book now! Rates from US$17.41++. Average rating 6.9 from 34 reviews. 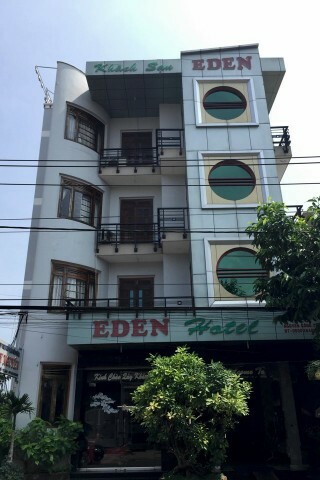 Eden’s modest size makes it feel more like a comfortable guesthouse than the typical bland local hotel. Flashpackers will appreciate the bright, clean rooms that are outfitted with a generous amount of furniture such as wardrobe, desk and bedside table. Rooms feature tile floors, air-con, WiFi, a fridge, flatscreen TV and floor length mirror, as well as a new tiled bathroom. It’s located on a quiet street with some local eateries and there are drinks for sale in the lobby. It’s located east of the victory monument, a block from Dam San Hotel. Overall a good choice for flashpackers. Check rates at Eden Hotel on Booking.com.